Pav Bhaji Powder - Few pinches to sprinkle on the tortillas. In the mean time, cook the tortilla in stove top using a roti pan. Cut it into required shape. Arrange it in the pre-greased cookie sheet. Bake it for 6 minutes and turn the pieces around and bake it for another 5 minutes or until it is brown. 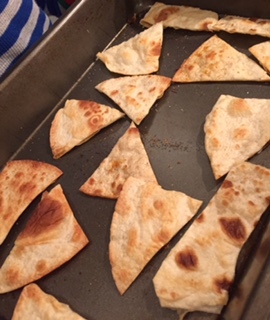 I gave these chips to my girls for snack along with homemade Salsa.